From personal experience or by talking to coffee lovers around you, you will find that there are two versions of espresso making machines. The traditional coffee machines where the steam wand is made use of to place pressure on the coffee puck and ones that have a pump for it. It is clear that consistency is a feature of the espresso machines as better pump pressure is achieved. 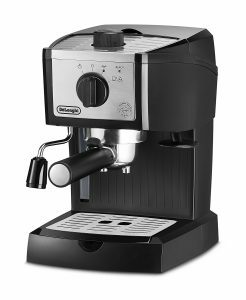 So if you are willing to shell out the bucks for a fantastic cup of espresso then the DeLonghi EC155 Espresso Maker is ideal. This machine drums up a nice coffee maker, consistent and thick cream that makes the espresso mouthwateringly delicious. EC155 is the best Automatic Espresso Machine that has been a name in the Italian appliance industry. you will no longer go to a coffee shop you can make delicious espresso at home. and this is the best solution everytime you want to have an espresso shot at home, dorm room or small apartment. EC155 Separated water and steam thermostats in which it can brew a cup of coffee and also frothed milk. In cleaning the water tank and drip tray it can be easier and faster because of the removable 35-ounce water tank and drip tray. Uses loose grounds as well as convenient pods. and it has a self-priming operation which prevents the hassles associated with espresso machine startup. This EC155 is ideal if you aren’t exactly familiar with espresso but want to try it or have been using combo-machines. Make use of a really good grinder and also excellent quality of beans and you are on your way to memorable coffee times. So how do you make that perfect cup of espresso with the DeLonghi EC155? Let us show you how. 2. Place back the tank in the original position. You can apply light pressure to open the valve that is present below the tank. You can directly pour water into the tank using a jug, but that might lead to spillage. There will be water in the area below the tank and also this should be cleaned regularly with a sponge or washcloth to avoid germs and also bacteria from collecting. Please note that you should never start using this machine without the presence of water in the tank. Always top up the water the minute it reaches an inch from the bottom of the tank. This helps you get espresso coffee at just the right temperature. 15 minutes prior to when you want the coffee please set the selector knob to the intended position. After doing this, you should make sure that the steam knob is not open and also that the filter holder is in an attached position. 4. Before you begin making your first cup of sinful coffee delight, do follow two simple steps. When you are using the machine for the first time, thoroughly clean all the accessories and internal circuits. You might also want to consider making 5 cups of coffee. Going back a bit, once the appliance has been pre-heated, you can go about placing in the filter holder, the ground coffee filter. The projection should correctly be inserted in the slot provided. Next, take the smaller filter if you want to make just 1 cup of coffee, for 2 cups you can take the larger filter. For one espresso cup take about 7 grams of ground coffee in the filter, for two cups you will need roughly 12 grams. Go about filling the filter with little ground coffee at a time, so that no overflowing occurs. Make sure that you clean the filter thoroughly to avoid unpleasant mixing of any previous infusions with your coffee for the day. The next step would be to have the ground coffee distributed evenly. Apply gentle pressure using the tamper. When the ground coffee is correctly tamped. Get the espresso in the consistency you desire. Do not overdrive with the tamping as otherwise. The delivery of coffee become sluggish and slow and your cream will not be light and also creamy, it will be dark. Do not go about the tamping lightly as the delivery will then be real quick. The froth will become minimal and also light. Excess coffee should do away with from the filter holder rim. And then reattach it by rotating firmly. Place a pre-heated cup under the spout of the filter holder, wait for the indicator light OK to come on. Once you have the required quantity of coffee, turn it back to the original position. Sit back and relish your cup of smooth, creamy espresso.